Blow Drying has Never Been this Fast! Achieve the Perfect Blow Dry in Half the Time! Unique two part formula helps cut down blow dry time for faster, stress-free styling while delivering light conditioners keeping hair smooth and frizz-free all day. Best of all it protects the hair from at iron or curling iron heat up to 450°F while revitalizing fragile, chemically treated, and depleted hair leaving it glossy and vibrant. On Damp Hair: Shake well. 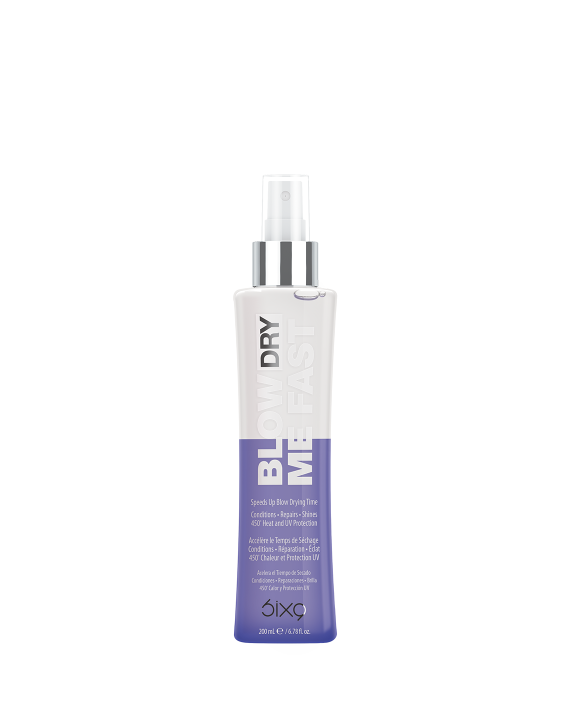 Spray onto towel-dried hair as a last step before blow drying. Style as usual. On Dry Hair: Shake well. Spray on as a shield and sealer for at-irons and curling-irons. As a Finishing Mist: Shake well. Spray for an exquisite shine. te, Glyoxal, PEG/PPG-18/18 Dimethicone, Parfum (Fragrance), Linalool, Hexyl Cinnamal, Butylphenyl Methylpropional, Alpha-Isomethyl Ionone, Limonene, Coumarin, Hydroxyisohexyl-3-Cyclohexene Carboxaldehyde, Geraniol, CI 60730 (Ext. Violet/Murasaki401).